Edit the look of a Facebook Messenger code (beta). Is there a better alternative to Scan Code Editor for Messenger Codes? Is Scan Code Editor for Messenger Codes really the best app in Email and Messaging category? Will Scan Code Editor for Messenger Codes work good on macOS 10.13.4? 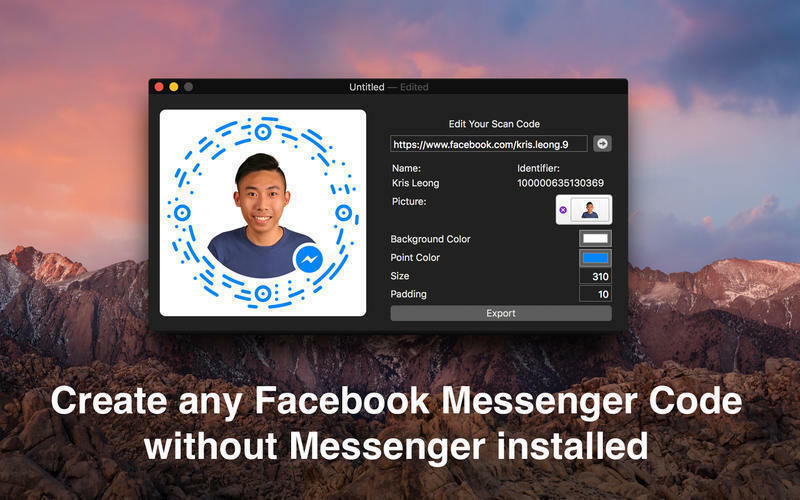 Scan Code Editor for Messenger Codes allows for the creation of a Facebook Messenger Code of any Facebook user without having Messenger installed just by providing his profile address. Suitable for printing professionals who need this code in high resolution or vector quality or anyone who needs it for marketing purposes. Scan Code Editor for Messenger Codes needs a review. Be the first to review this app and get the discussion started! Scan Code Editor for Messenger Codes needs a rating. Be the first to rate this app and get the discussion started!